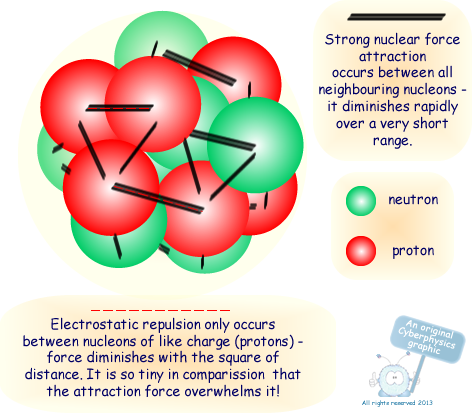 The nucleus of an atom contains nucleons: protons and neutrons. Protons repel each other via the Coulomb force but over a very short range (femtometres) there exists a very strong force called the strong nuclear force. This binds the nucleons together into a nucleus. The number of neutrons (N) affects its physical properties - which isotope of the element it belongs to. Various types of scattering experiments suggest that nuclei are roughly spherical and appear to have essentially the same average density. If we call the constant of proportionality ro we get the above equation. If r is plotted against A1/3 a straight line is obtained - the gradient of it is the constant ro - but the relationship is best for large values of A so if you use small values this does not work too well! 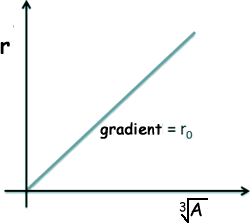 This means that the density does not depend on A or on r - it is related to constant values - it is therefore a constant value and uniform. The most definitive information about nuclear sizes comes from electron scattering experiments. If we compare calculated and experimental radii for nuclei we find that that there is an area around the edge of the nucleus where the density of nuclear matter decreases toward zero - but that the central part is roughly of constant density. So the nucleus cannot be thought of as just a hard sphere. The fact that the nuclear density is independent of the details of neutron number or proton number suggests that the force between the particles is essentially the same whether they are protons or neutrons. This agrees with other evidence that the strong force is the same between any pair of nucleons.